Showing 1 to 10 of 19 posts. It is our pleasure to invite you for a concert on 4 October 2017, 19:30, Arnold Schoenbergzaal. The concert will feature works by Visiting Professor Kerry Hagan (Ireland), Sonology students and staff, and two works from 1967 (Funktion Grün by Gottfried Michael Koenig and Extérieur by Jos Kunst) to celebrate the 50th anniversary of the Sonology one-year course. We will also present the new CD Post Scriptum 2: a double-CD set with works by (former) Sonology Research Associates (limited edition of 500 copies). Thursday 7 September 2017, 19:30, Kees van Baarenzaal. On the programme are individual and collaborative multichannel fixed media compositions, a beautiful film by director Alcaeus Spyrou with music by Chris Loupis, a work for viola and electronics by Hibiki Mukai, a performance by the Sonology Electroacoustic Ensemble and a performance by Kacper Ziemianin with his prize-winning live electronic music instrument. Admission and drinks are free. We hope to see you there! Sonology bachelor's and master's students who are about to graduate will give their final concert presentations on 26, 27, 28 and 29 June 2017. All concerts start at 19:30. 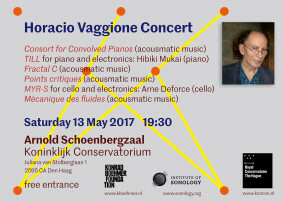 Sonology Discussion Concert 3, 15 February 2017, 19:30, Arnold Schoenbergzaal. The symposium and festival "Historically Informed Performance Practice of Electroacoustic Music" includes several public concerts and masterclasses, of which the programme can be found here. Sonology Discussion Concert 2, 30 November 2016, 19:30, Arnold Schoenbergzaal. Extra Concert with final exam presentations by Adam Juraszek and Áslákur Ingvarsson, and an improvised music workshop presentation with the Sonology Electroacoustic Ensemble directed by Richard Barrett and Paul Obermayer.